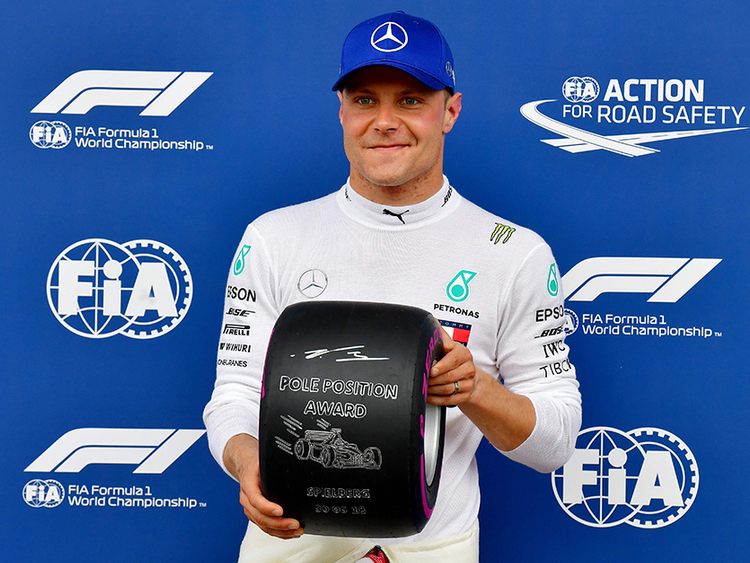 Spielberg: Mercedes driver Valtteri Bottas edged teammate Lewis Hamilton in qualifying on Saturday to secure pole position for the Austrian Grand Prix. It is the third straight race where Mercedes has locked up the front row of the starting grid. Bottas led Hamilton by 0.019 seconds to get his first pole of the season. The Finnish driver also started in front last year and went on to win the race. Sebastian Vettel was more than three-tenths off the pace in third, followed by Ferrari teammate Kimi Raikkonen. Earlier Saturday, Vettel posted the fastest time in final practice. The German trails leader Hamilton by 14 points going into Sunday’s ninth of 21 races. Max Verstappen was fifth for Red Bull ahead of Romain Grosjean of Haas, Daniel Ricciardo in the second Red Bull and Kevin Magnussen in the second Ferrari-powered Haas. Carlos Sainz was ninth ahead of his Renault teammate Nico Hulkenberg. Earlier, Ferrari’s Sebastian Vettel pushed Hamilton off the top of the Austrian Grand Prix practice time sheets while Red Bull’s Max Verstappen hit problems. The German lapped the scenic Red Bull Ring in a track record one minute 04.070 seconds, a mere 0.029 quicker than fellow-four times world champion Hamilton in the Mercedes, with sunshine replacing overcast skies. “The engine just shut down,” the Dutch 20-year-old, who had an army of orange-shirted fans packing the grandstands and is eager to make up for crashing out on the first lap last year, said over the team radio. “Hopefully it’s as simple as a box being changed,” Red Bull principal Christian Horner told Sky Sports television. Hamilton was quickest in both of Friday’s practice sessions. The top three teams again filled the top six places, with Ferrari’s Kimi Raikkonen fourth fastest ahead of Verstappen and Red Bull’s Australian Daniel Ricciardo in sixth place. France’s Romain Grosjean, still without a point this season, was seventh with Haas teammate Kevin Magnussen eighth and Renault’s Carlos Sainz ninth.